Do you find that certain fiber activities are seasonal? I feel that way about working with wool. Even though I've been semi-diligent with my Shetland Sampler Cardigan, the hot weather has finally gotten to me and I have no enthusiasm for working with wool. Not only as in yarn and knitting, but even for spinning. However, the fruit of my cotton lint dyeing experiment is most abundant. I have a rainbow assortment of over 15 different color samples of approximately 100 grams each. What an excellent summer change of pace. usually 3/4 to 1 and a half inches in length. It is also fine, about 25 microns in diameter. For these reasons it has a reputation for being difficult to spin. But really, it isn't all that hard. I make my own punis, which are slender cotton rolags. I use my Ashford cotton handcarders. I tease the fiber out a bit and then load it on the one edge of the carder. This way it makes a narrow batt. You can load the entire carder; I just find it easier to do a neater job this way. I use a quarter inch dowel to roll the punis with. Actually, this is my wraps-per-inch counter, the same one used in my Measuring Wraps Per Inch (WPI) post. I smooth the puni by rotating the dowel rod with one hand, using the other to press down the stray fibers. I continue to roll the dowel and twist the puni off the other end. This had not created an entirely smooth preparation however. I think this is partly because the Ashford cotton carders, which have a finer carding cloth than their regular carders, are still not the finest on the market. Also, the cotton lint has bits of husk and whatnot in it. I pick as much of this out as possible, but some remains behind. I spin these with my wheel. I'm not a spindle spinner, nor do I have a charka, but a flyer wheel does nicely if adjusted properly. To spin, I loosen my drive band (for double drive) or break band (for single drive) as much as possible. Cotton requires a lot of twist to hold it together, so I use my highest spinning ratio. A lower ratio is useful to get a feel for spinning it, but it requires a lot more treadling. It also wants to be spun into a fine yarn. I use the long draw, and the punis spin up quickly. I haven't decided what to do with it all yet. I have tried and never mastered spinning cotton. I am jealous that you have! I will have to give it another try, I would love to have handspun cotton yarns to use. Your cotton yarn is great. Like Alice I've tried spinning cotton but haven't had any luck. Your sucess may be enough to give me the nudge to try again. Being an accidental spinner, I'm in awe of anyone who spins *anything*. My drop spindle, is really a fly across the room spindle, and my lovely old wheel sits idle. 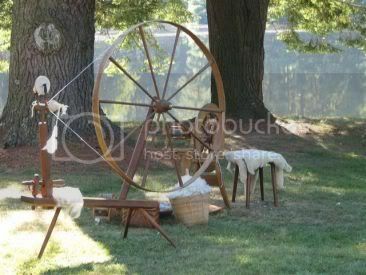 Yes, spinning intimidates me, and is my most humbling fiber experience -- e v e r.
Your cotton looks so lovely and fine. It's going to be so much fun to see your rainbow at the end of the summer. Summer is just not conducive for working with wool in my mind, either. I don't really know why, but at that first hint of fall in the air -- *then* I run to my wool stash -- but when summer rolls around, it's lighter stuff for this gal. Leigh, your photo illustrations are so excellent from weaving, to spinning, to dyeing. I keep feeling that there hast to be a Leigh's book at some point in your fiber journey. I'd be first in line to buy it! Ya'll, spinning cotton really isn't that hard, especially the lint. I've had cotton rovings which are slipperier, but this stuff isn't bad at all. I'm looking into buying cotton carders - are there any that you would recommend? I would like them rather fine, so maybe the Ashford ones wouldn't be my choise? Tina, I think if I was going to buy cotton carders now, I'd opt for Strauch cotton carders. They are wider (good for punis) and have 255 teeth per square inch. My Ashford cotton carders only have 108 teeth psi. 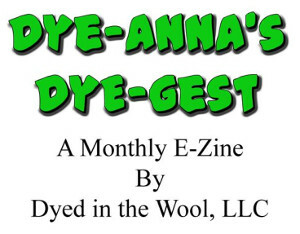 They are nice for fine wools, but not the best for cotton or angora. The Strauch cost a little more, but I'd just consider it an investment. Handcards do wear out eventually, so I think that's what I'll get when that happens. I love black with turquoise! I think Rascal does too. I think you have good taste, Rascal. Sharon, Rascal loves anything soft and cushy to nap on! The odd thing is, he even claimed the cotton while it was still wet. I only discovered cotton spinning when I did the workshop in the OLG - but I really fell for it. once you get the knack of it, it's great fun. for some reason I had no problems spinning on the simple louet, fiddling about with the spindolyn took me longer! and most people say that spinning lint is easier - but for me it's easier to spin top - go figure:)) and yes, even though Ireland isn't exactly "hot" in summer, I prefer to spin and knit cotton or silk right now too! any plans on what to do with all your cotton? Great photos and tutorial, Leigh! Thanks for this. I haven't done any cotton, mainly because I think it would take me forever to spin, with all of the twist needed. Your work looks great.